Again, this blog gets a chance to update a previous story with a 'new' find. 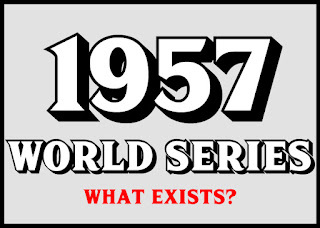 This time, it is in respect to the 1957 World Series. As previously highlighted in one of the first posts nearly 6 years ago to-the-day, Doak Ewing and RareSportsFilms has a cache of 1957 World Series kinescopes. Residing in that collection are Games 3, 4 and 7 confirmed. It also appears that Game 6 of that series exists as a partial and there have been rumors that a complete Game 1 is in their possession. Game 5 of the 1957 World Series, except for parts of the 2nd, 3rd and 5th innings is shown on this new 1-hour, 27 minute DVD! The game's length, as listed on B-Ref, is 2 hours. If this game has only a short amount of pregame (as Game 3 did) then it is likely only missing roughly 35 minutes worth of the game. This game has been heralded as one of Whitey Ford's best performances, despite only striking out 2 while scattering 6 hits. The two most important plays from this game should be intact in this recording. Those plays, Jerry Coleman's lack of urgency on Mathews' groundball in the 6th and Mantle's caught stealing in the 8th, are attributed to the outcome in this game. Also on display in this game are the two leading candidates for MVP from the Braves side. Aaron picks up 2 more hits in the Series and Lew Burdette goes the distance for a CG win. Hopefully this is a step towards whatever remaining games from this Series finding their way into daylight. A near complete series showcasing Hank Aaron in his prime is a real treat for fans. More to come on this game when it is available!